This fly fishing belt buckle is finely sculpted and intricately designed from fine 100% lead free pewter. 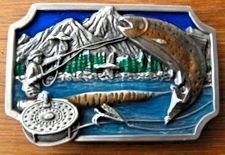 This rainbow trout belt buckle is colored with light brownish gold enamel on the trout with a blue-green enamel lake, green pine trees, and mountains in the background. There is a man flyfishing in the water and a rod and reel in the foreground. This fishing belt buckle measures 2" x 3.25 inches and fits up to a 1.75" wide belt. "Fly fishing takes great skill and is the most difficult type of sport fishing. To be a fly fisher is to have experienced the best that fishing has to offer." 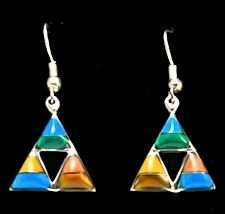 This would make a great gift for any avid fisherman! Not produced by or the product of a particular indian or indian tribe as defined by 26 USA - 605 et Seq.